If you have owned a white leather couch for a few years, you may have decided it is time to recolor the leather. Whether you want to change the color from white to a darker shade, or want to return a worn couch to its former pristine whiteness, you must ensure that you select the correct coloring kit to guarantee the best possible results. While there are many types of DIY leather recoloring kits on the market that contain leather-safe dye, you should avoid using paint to recolor a white leather couch. 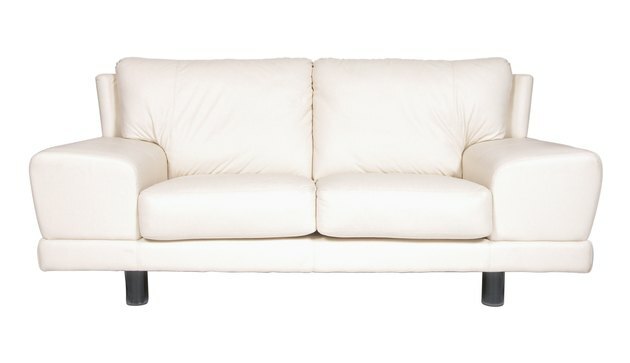 White leather couches can be dyed using special dye kits. Dye and paint are both used to change the color of certain materials. Dye penetrates the material's fibers, creating a color change that is bonded into the material itself. In contrast, paint simply applies color to the surface of an object, without penetrating to create a permanent color change. When trying to change the color of a white leather couch, you should only use leather dye kits, as paint can flake away over time and be unpleasant to sit upon. To dye a white leather couch, you must be certain to select a DIY kit that was designed for use with the type of leather used to create the specific piece of furniture. DIY leather recoloring kits come in two main types: kits designed for use on regular leather, and kits to be used only on aniline leather. Because aniline leather uses soluble dyes, the dye used to recolor the couch must also be soluble. If you don't know offhand what type of leather was used to make your white couch, you can examine the couch to make that determination. Aniline leather can be identified by the presence of visible pores or scars, or if the texture of the hide itself is visible when looked at closely. If you have a white leather couch, you can opt to re-dye it back to its original shade of white, or dye it a darker color. Color-match the dye to your couch by eye, or you mail a sample of your couch's leather (trimmed from a part of the couch that is not visible, or from a manufacturer's swatch) and provide that to the company that makes the leather dye for it to find the best match for your needs. The process by which you apply the new color to the couch will be outlined in your DIY kit, which can be purchased online or at a furniture store. First, you will clean the couch with the provided cleaning solution and cleansing pad. Next, you will apply a thin layer of the dye, and allow it to dry. After repeating this process so that you have at least two layers of dye, you must let the surface dry overnight before resuming use of the leather couch.